Having the ability to run, jump and slide at any given time is a dream come true, right??!! Okay, maybe not, but our Party combo lets you do all of these things in one fantastic inflatable! 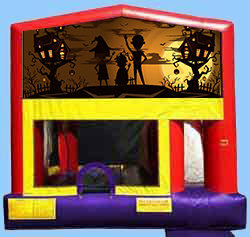 There is a jumping space, a 12 ft slide, and a basketball hoop to show off your skills. Sorry! Basketball is not included. We can add any of our dozen of special themed banners, like the Happy Haunting banner, to this amazing ‘All for One’ inflatable to make your party one of a kind and perfect! Book now! Online, anytime! Or call with any questions, 5058-792-6620.